The Sangoma Portal is your one-stop spot to purchase all add-ons for your FreePBX system – from appliances and paid support to commercial modules and more. Sign up for a free portal account. Get technical support from our FreePBX experts! Advanced training to market, sell, deploy, troubleshoot, customize and administer Asterisk/FreePBX. As the sponsor and maintainer of the FreePBX project, Sangoma offers FreePBX compatible phones, gateways, telephony cards and more. Connect your PBX to the outside world with SIP trunking services from the FreePBX Team. Interactive Voice Responses can help improve your customers’ calling experiences. Virtual hosting of the Official FreePBX Distro. Take your FreePBX experience to the next level with a commercially developed and supported version of FreePBX. 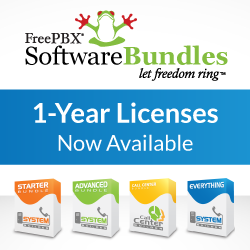 Add-ons that extend the capabilities of your FreePBX deployment. The only officially supported hardware solution for FreePBX.